To show that I eventually follow up on every recommendation made to me I went yesterday to Taco Loco in Laguna Beach which was recommended to me almost exactly two years ago. I was accompanied by Griffin Tamura of the Griffin Eats OC blog. Griffin had been to Taco Loco before and on our way there he asked what I knew about it. I said, "Well, I've heard that they had mushroom tacos and tofu tacos." He said, "Yep, and that's what I usually get." When we arrived we were lucky to find one metered parking spot out on PCH but when we parked there the curb was so high that I couldn't open my door to get out. I was all ready to roll down the window and do a Dukes of Hazzard move but Griffin pulled the car away from the curb and I got out in the traditional way, then he pulled the car back in, we fed the parking meter a few quarters and walked the few steps to Taco Loco. The only problem is I walked a few steps too far, right past their real building, and on to their spillover building on the other side of the driveway. I don't know what's in this second building but it does say "Taco Loco" above it and it does have Taco Loco customers eating outside. 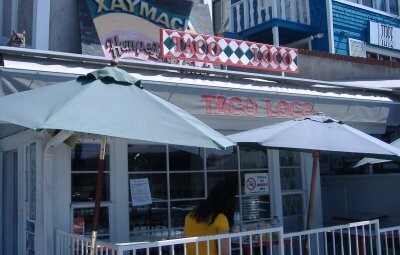 The point is, you'll want to go in the southernmost of the two Taco Loco buildings, the one you see pictured above. 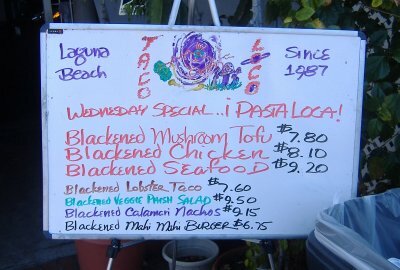 Fitting right in with the Laguna Beach zeitgeist, Taco Loco presents a laidback, hippie-ish vibe with meat on their menu but also a definite catering to vegans and vegetarians. I quickly looked for the mushroom tacos and the tofu tacos and found out they have both but that they also had a a mushroom tofu taco. I knew then that's what I would order and that everything else I might get would supplement it. I added a blackened fish taco and the soup of the day which was black bean soup which was actually just a styrofoam cup of black beans. They were good as far as beans go but I think it's a little bit of a stretch to charge $3 for a cup of beans. They do top it with whatever you want on it such as onions, cilantro, guacamole, etc., so that adds some value. My tofu mushroom taco came in a blue corn tortilla and was topped with their guacamole (which is more like a cross between guacamole and salsa - very light) and a little spicy hot sauce. The mushrooms tasted like mushrooms but the tofu tasted like chicken and I think that may have been on purpose; I had been expecting something like the tofu cubes found in miso soup but I should've known better. 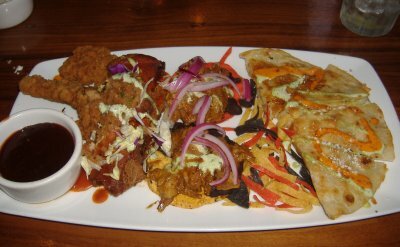 Made a couple visits to Gabbi's (not "Gabby's," "Gaby's," "Gabbie's," "Gabriella's," or "Gabi's") Mexican Kitchen this week to try out their new desserts and to just generally enjoy their food. It's not hard to see why they are continuing to garner awards and attention from far and wide. 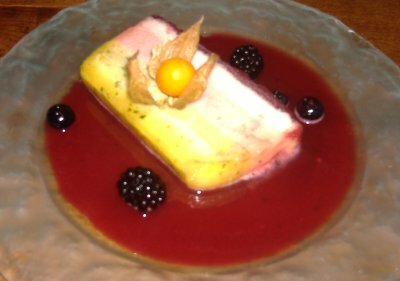 The new desserts (the sorbet terrine and the postres surtidos) were similar to but not exactly what I'd heard they might be. 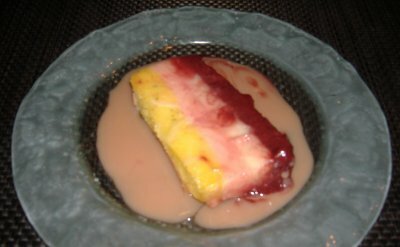 "Mango, guava, and tropical fruit sorbets in a guava coulis"
On the second visit this week I met up at Gabbi's with my mother, brother, and nephew. We had exceptional natural lighting at our table so I took advantage of it by taking pictures of all our dishes (well, I didn't photograph the chicken fingers but even those looked good). 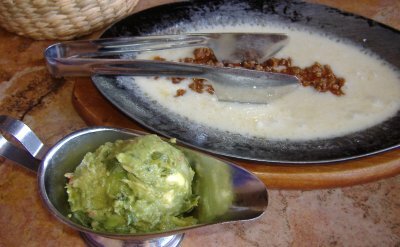 We all shared the Queso Fundido con Chorizo as an appetizer. Mom got the shrimp salad which she said is the best she's ever had. 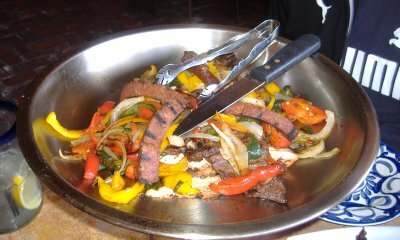 Dave went all out and got the enormous Parrillada Mixta, which was very impressive. Dave had never been before but kept commenting during the whole meal how good everything was. I got the mahi mahi tacos which were on special for the day, and Scottie got the chicken fingers (not pictured) from the kids menu. 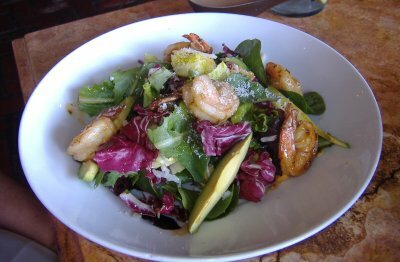 "Grilled Shrimp in a citrus lime mojo, jicama, cotija cheese, avocado, pine-nuts, Hawaiian papayas, cilantro, romaine & mixed greens tossed with a tamarindo dressing." "Grilled platter of arrachera, Portuguese chorizo, chicken en achoite, tri-color peppers, cebollita & handmade tortillas"
"Vanilla bean flan, berry tres leches cake & Banana fried ice-cream"
We have even more Gabbi's coverage that you can read all at once by CLICKING HERE. Calling all college students! Your hearty appetite can earn you or your organization a break from cafeteria food! Tacos & Co., the Orange County eateries known for fresh and authentic Mexican favorites, challenges you to stuff your face with all the tacos that you can eat. 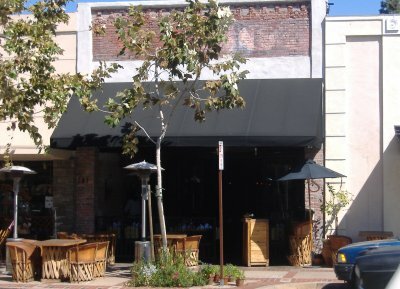 On Monday, April 7, 2008 at 7:00 pm, Tacos & Co. will host a Taco Eating Contest at its Irvine restaurant. The first place winner or their organization will receive a Tacos & Co. $100 gift certificate while the second place winner will receive one for $50. However, Tacos & Co.'s tasty and delicious tacos are enough to make every participant feel like a winner. Don't forget to take advantage of Tacos & Co.'s phenomenal 50% off all food deal for students who attend area colleges every Tuesday and Thursday (with valid student ID). To register for the April 7th Taco Eating Contest at Tacos & Co. at Irvine, please contact tacosnco@netzero.com. 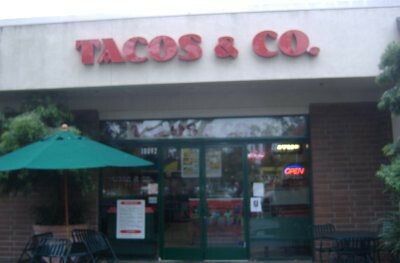 Tacos & Co. Irvine is located at 18092 Culver Drive (Culver & Michelson). Space is limited, so enter NOW! 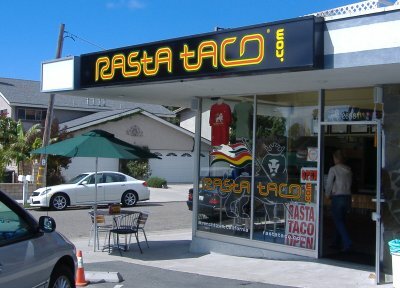 UPDATE: The Capo Beach location of Rasta Taco has closed down. 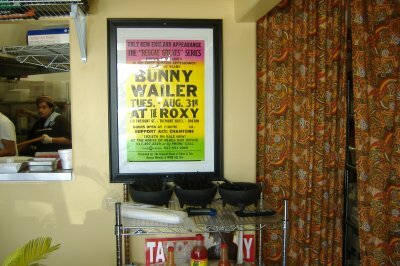 It is scheduled to re-open on June 1, 2009, at The Camp across from the Anti-Mall in Costa Mesa. Stay tuned for further updates. Question: How do you make food from a Mexican taco cart even more laid back? 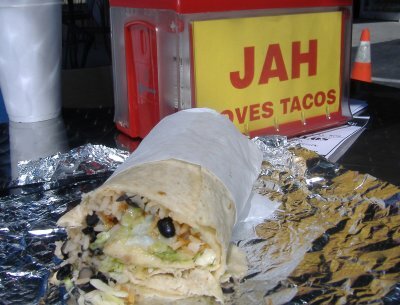 Answer: Add a reggae influence just as Rasta Taco has done. 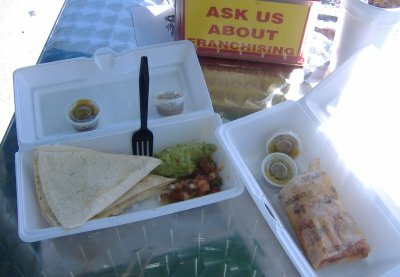 Rasta Taco started out as a taco cart catering company (and it still is one) but recently opened up a stationary, non-mobile restaurant in Capistrano Beach. I had mentioned it here on the blog before but finally got to go down there last Saturday with my brother Gary to sample the wares. Ironically, neither of us got tacos. 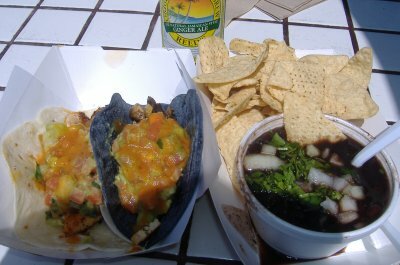 I had tried their tacos before at a taco tasting at Salt Creek Beach and wanted to try some other menu items this time. 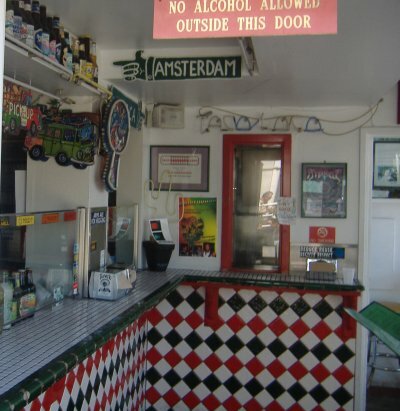 The whole place is done up in the red, yellow, green reggae theme and when we pulled up there was a guy coming out who had obviously been growing his dreadlocks since long before Rasta Taco came on the scene. 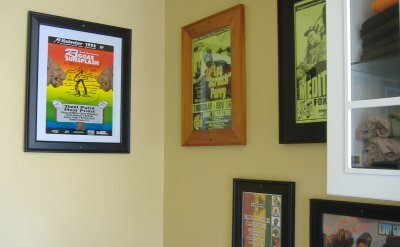 We noted the posters for different reggae concerts on the wall including one for Lee "Scratch" Perry. Gary saw it and said, "I have his CD in the car. We can listen to it on the way back." 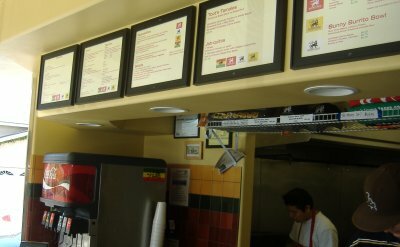 Most of the menu items are named after reggae artists, such as the Lee Scratch Breakfast Burrito, the Yellowman Breakfast Burrito (I'm sure the cheese on it is "yellow like cheese"), the Pato Taco (not a duck taco, but named after Pato Banton), and Ziggy's Medley Taco Platter. Gary got the "Peter Fish Burrito" which we strongly suspect is named after Peter Tosh. It looked like it was loaded "to the gills" with fish and beans and rice. I went for the Eek-A-Mouse Quesadilla and a Toot's Pork Tamale. The tamale was the best I've had in a long while, with the masa being moist through and through and the pork nice and tender. And I used plenty of their mild verde salsa on both my items. 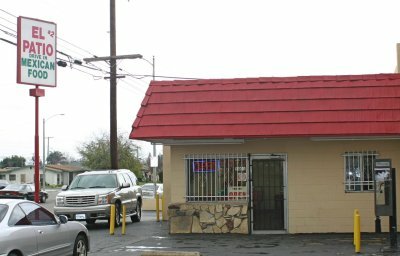 And for Vanilla Coke lovers, this is the only other Mexican place I know of in addition to Rubio's that has Vanilla Coke. 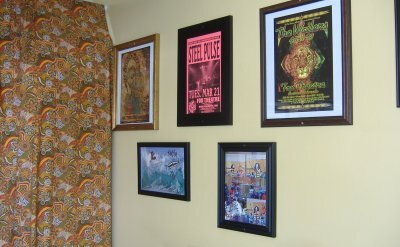 Also, you can view their menu online (see link to their official site above) and call in your order ahead of time and they have a full line of Rasta merchandise at the store: stickers, shirts and more. UPDATE: This location has closed and is now called Mi Casa. 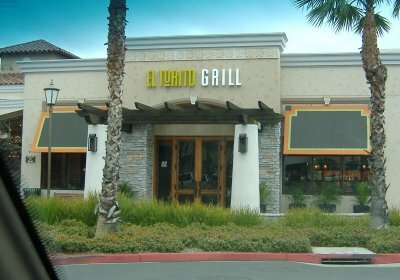 With so many people searching for information on "El Torito Grill in Rancho Santa Margarita" or "El Torito Grill RSM" I knew it was time to round up my El Torito Grill buddies, Chris and Kristanna, and make the trek out east down the 5, the 133, and the 241. I'd been to this location before when it used to be called Agave Mexican Grill. I'm not sure why Agave Mexican Grill went out of business. Maybe it just didn't have the name brand recognition that El Torito Grill has. 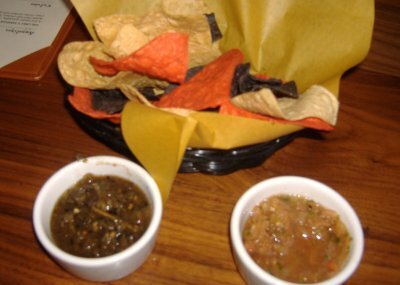 We started out with a basket of chips and salsa, the first time I've ever had chips and salsa at an El Torito Grill. 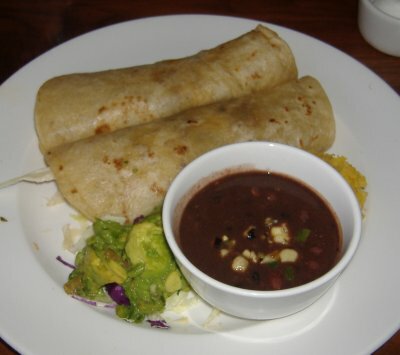 We wondered if maybe they had got rid of serving the handmade tortillas with honey butter so we inquired and they brought us some of those too. They aren't pictured but we still got 'em and we still loved 'em. I turned their special appetizer of the moment into my entree. 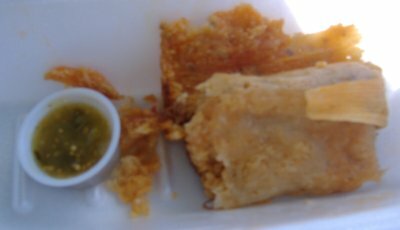 It consisted of a lobster quesadilla, two carnitas tostadas (probably the best part of the meal), chicken tenders (yeah, that's not Mexican but that's what came with the plate), and, get this, a deep-fried beef tamale. Chris the carnitas fiend veered slightly from his usual El Torito Grill order of the Carnitas Yucatan platter with an order of two carnitas tacos that he requested be made into burritos instead. What he ended up with was more like tacos that had been rolled up slightly but he said the carnitas meat was as good as ever. 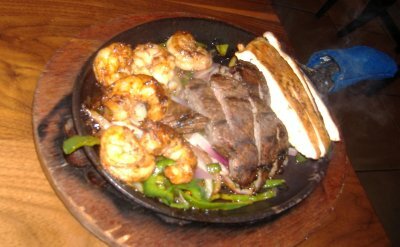 Kristanna ordered the sizzling steak and shrimp fajitas. I forgot to get her opinion on them but they sure look good. We didn't get dessert this time but we might've if their special dessert was anything different from what it was when we went to the Brea location back in November. Since it was still the deep-fried ice cream we went to a nearby bakery and got some Boston cream pie that was too rich to finish. 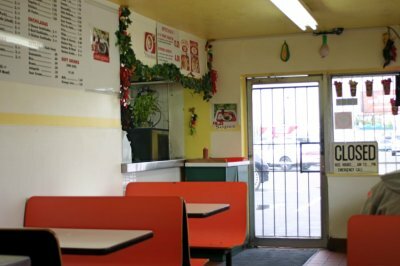 I was up in Anaheim looking for a quick lunch and remembered reading about El Patio. Every place I have come across the name on the Internet it was positively rated. So I gave it a try. There's nothing fancy about the way El Patio looks and with "drive in" as part of the name you might not expect a concrete block bunker with bars on the window. This is the definition of "drive in" that I came across in Hawaii. It really means you can drive up to it and park in front. So after looking at the other buildings nearby I realized that this was the much praised spot. Well, I love my little hole-in-the-wall places. Inside it isn't any fancier. Just seven small booths in a little dining area and a counter for ordering. The menu is big with over 20 combinations, none of which are over $5.95. They had #19, the taquitos combo on special for just $3.25. 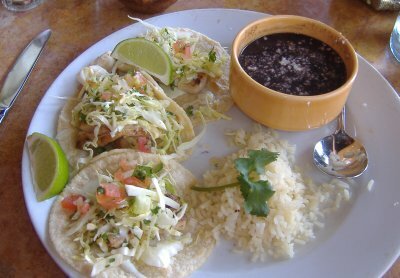 They cover all the standard fare - tacos, burritos, tortas, sopes, enchiladas, chile rellanos. While I was there lots of people came and went, mostly getting lunches to go. The shredded beef tacos seemed like a popular choice with the regulars. But the chile verde plate caught my eye. Everything is made to order here. So it takes a few minutes to get your order, but it was piping hot upon arrival, which was good on the cold rainy day I went. You can see they serve it up on a plastic tray with a bottle of their hot sauce, fresh tortillas and escabeche. The escabeche was about the freshest I have had. If you've seen the review for Pepe's here, then the set up might look familiar. In a lot of ways this place is similar to Pepe's in what they offer and the style of food is pretty similar. 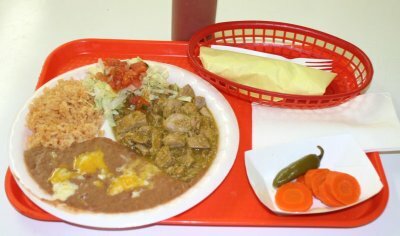 But having had the chile verde plate at both places I have to give the nod to El Patio. The plate I had was melt-in-your-mouth tender. The pork was very flavorful. The green chile sauce it was cooked in had just the right amount of heat and a lot of flavor. They had a big pot filled with hunks of pork cooking away when I ordered so I know they are making this stuff fresh in the shop. Beans and rice were well made, but standard takes on the stuff. As usual, I found the rice a good foil for the hot sauce, which is a thin, tangy and pungent concoction. Beverages include soft drinks, milk, orange juice and the full complement of Juicy Whip products including horchata, tamarindo, and jamaica as well as their takes on drinks similar to Orange and Piña Colada Bang. For good flavorful Mexican standards at bargain prices, I give them 4 Speedys.